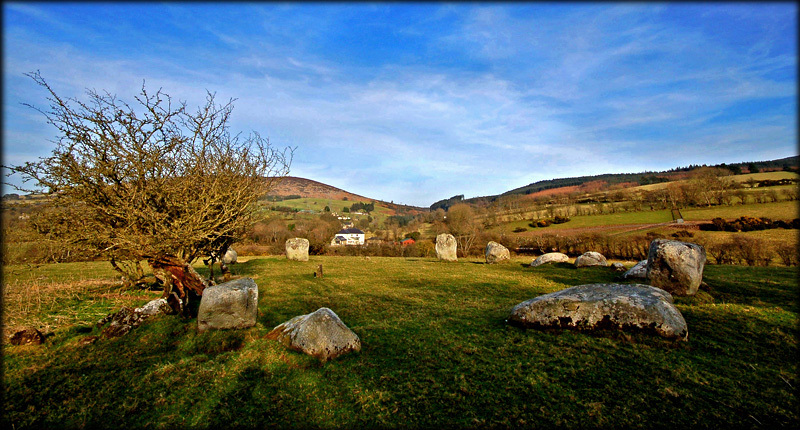 The stone circle at Athgreany is probably the first one I visited in Ireland. It is certainly the one I have visited the most. I would regularly stop at the site on my way back from Wexford after visiting friends. If you know where to look you can even get a glimpse of the stones from the N81. It is is known locally as the Piper's Stones. The circle consists of fourteen stones, three of the original seventeen are missing. This a true circle with a diameter of 23 metres. The local granite boulders that make up the circle vary in shape the tallest is 1.8 metres. Burl suggests the stones may have alternated between rectangular and oval. Thirty metres to the north-east is a huge outlier. 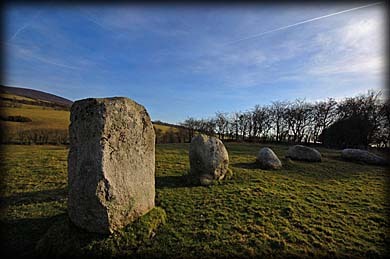 When you first enter the field from the roadway there are a number of stones in the field on your left hand side. It is believed that there may have been another circle in this area, some of the stones are placed a megalithic yard apart. Athgreany - Achadh Greine - translates as 'Field of the Sun'. Legend says a group of merrymakers were dancing to the pipers tune on the sabbath when God turned them to stone, the outlier being the piper. An old thorn tree also grows on the circumference. These are usually associated with the fairy folk in Ireland. I have always thoroughly enjoyed visiting this site, it exudes a wonderful atmosphere. 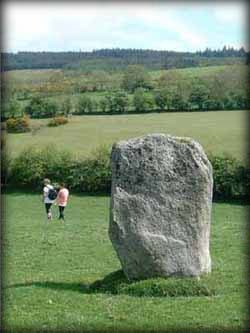 Situated: 10 miles north of Baltinglass on the Dublin road at Athgreany, the site is well signposted (The Pipers Stones). The stones are on a hilltop to the right about 150 metres from the road. Discovery Map 56: N 9297 0326. Last Visited Mar 2009.